This was a delightful hike break, taken during my drive home from the Black Canyon of the Gunnison. I saw the trailhead sign on my way there and decided to check it out on my way home. 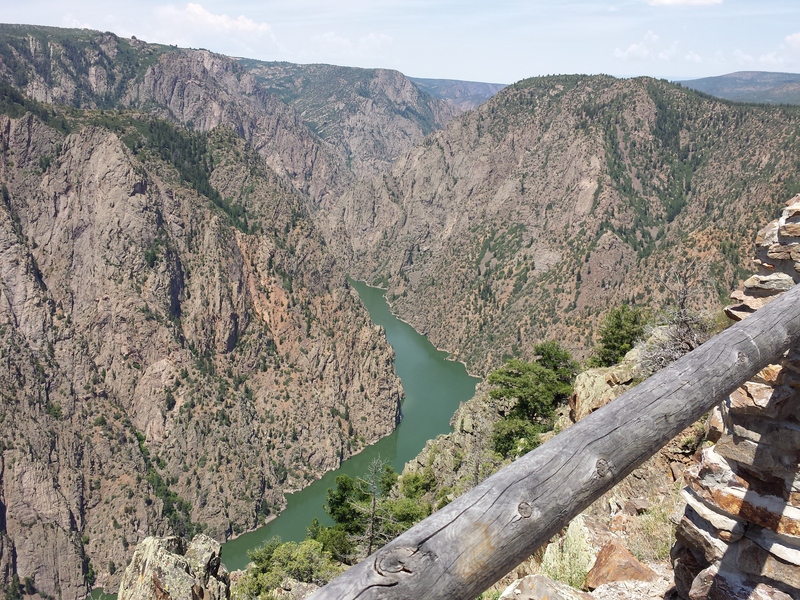 The trail is quite enjoyable, with a variety of wildflowers and views of the West Elk mountains, San Juan mountains, and Crystal Reservoir in the Black Canyon of the Gunnison. The trail is located in the Curecanti National Recreation Area. The upper portion of the Black Canyon of the Gunnison has 3 hydroelectric dams which form reservoirs: Blue Mesa, Morrow Point, and Crystal. Crystal dam/reservoir is the smallest and located at the entrance to the National Park lands. I don’t think very many people see Crystal Reservoir from this perspective, since it is not accessible by car. It was very quiet and secluded and certainly felt like a special place. Hmmm, I’m imagining a future kayaking/camping trip with my brother Chance, where we hike in with kayaks on the Mesa Creek trail, and paddle along Crystal Reservoir to Crystal Creek campground. Link to PDF map. The north rim of Black Canyon of the Gunnison National Park is less popular than the south rim, measured by quantity of visitors. There is no bridge, and it takes 2-3 hours to drive from the south rim around to the north rim. So, most people just visit the south. These video clips give a taste of the views from the north rim lookouts: Chasm View near the north rim campground, The Narrows View, Balanced Rock View, Big Island View, Island Peaks View, and Kneeling Camel View. Each overlook is a short walk from the north rim road. My favorite was the Chasm View nature trail and overlooks. On 7/2, I hiked North Vista Trail (7 mi. round trip) in the morning, and Deadhorse Trail (5 mi. round trip) in the afternoon. I enjoyed North Vista more than Deadhorse. Deadhorse goes through open fields and meadows, making it quite hot. And, the views from North Vista were more interesting. A highlight of the Deadhorse trail was a grouse sighting. The next day, I saw a stuffed display at a visitors center of a Gunnison Sage Grouse. The bird I saw on the trail was similar to the female display bird! 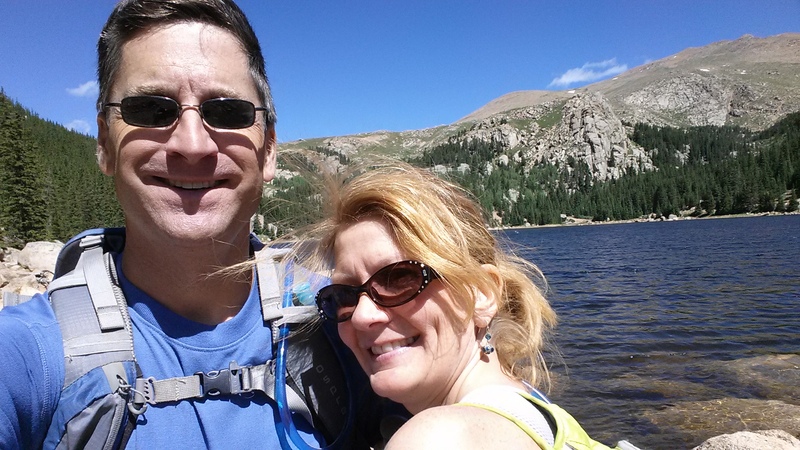 Today, Michelle and I enjoyed hiking in the Pikes Peak South Slope Recreation Area. The area is accessible by permit only. Dogs are not allowed–poor Sammy had to stay home. It was a 90-minute drive to get there from Colorado Springs via Old Stage Road, Gold Camp Road, and Forest Service Road 376. We hiked the Mason Trail from the parking lot up to Boehmer Reservoir and back. The most popular activity here is clearly fishing. Most visitors were fishing in the Mason Reservoir. We were the only hikers on the upper trail to Boehmer. And, what a beautiful place to go fish! The water was crystal-clear, fish seemed to be biting, and the views of Pikes Peak and Almagre Mountain are great. The Mason Trail passes through wildflower-strewn meadows for about a mile. Then, the remainder goes through pine forest until it reaches Boehmer Reservoir. Occasionally, there is a view of Pikes Peak. It’s interesting to see the cog railway in action, and glimpses of cars way way up on a section of the Pikes Peak Highway. We saw lots of wildflowers, but no significant wildlife viewing today. It was super-nice to share a Jeep/hiking day adventure with Michelle!